..the early Rhododendron is drooping – it thought we were into spring! …and this little crocus found a sheltered spot to grow. It’s always great to see the QH Hittys making the most of what comes their way. They were chilly but they really enjoyed the walk! Beautiful spots of color on a gray Winter day. The girls look warmly dress for their walk. It was so grey – we were happy to see the crocus and heather! The QH are getting a taste of life on the East side…Thank goodness their caretaker Keeps on top of things and is talented at sewing…they come prepared to face any and all challenges mother Nature throws at them! What a beautiful wayof dealing with a grey day!!! 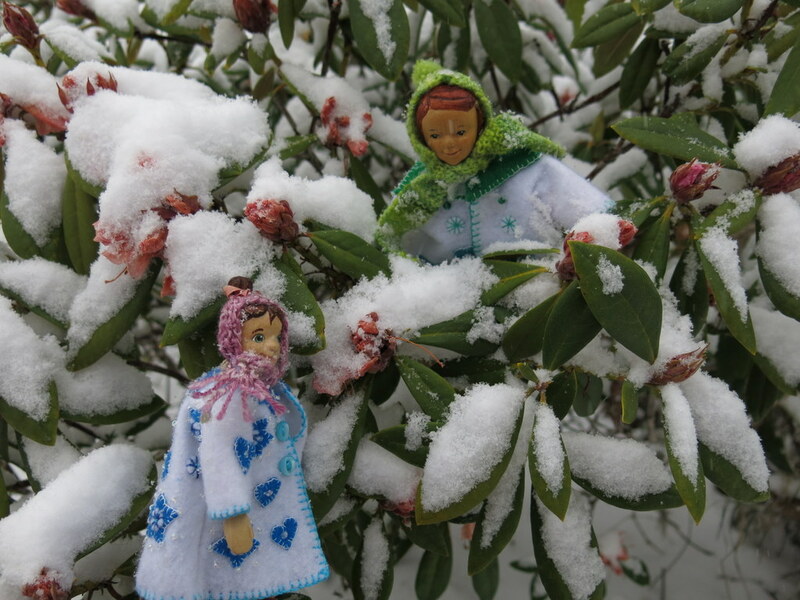 All the Hittys appreciate warm coats – whether they were made by me or by our friends…Mother Nature was foiled…we hope it warms up soon – here and there! Beautiful indeed, if you wish you can shake the snow off the rhododendron, cover it lightly with a white or pale colored bed sheet … hold the corners of the sheet with bricks … and it acts kind of like a gentle greenhouse for the plant. .
That sounds like a good idea – I will keep it in mind for the next time we get a cold spell. I think it is too late for this time. By the way, I love the Hitty coats. I need to make some for my Hitty family. 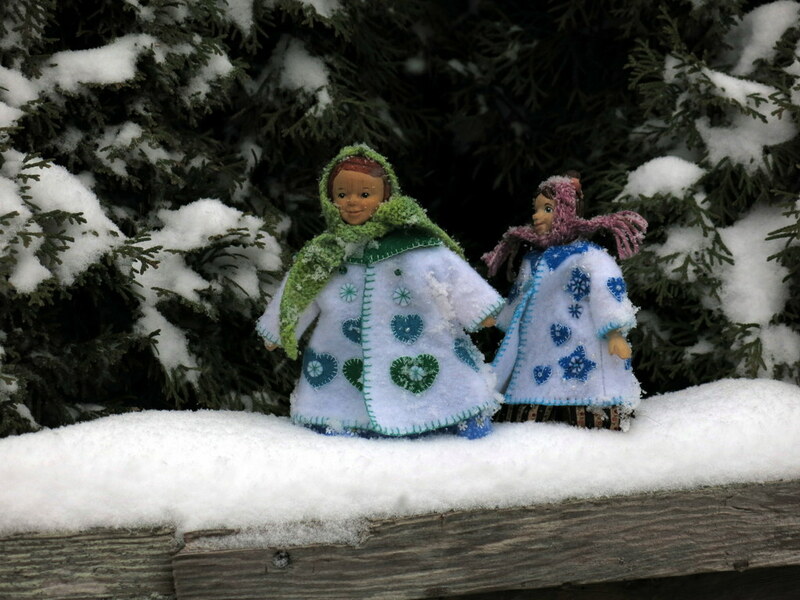 These coats are based on the Hittygirls pattern: Pauline’s Felt Coat Pattern. The HC Hittys would have loved to join the girls on their walk, but we are being pelted with ice pellets here. 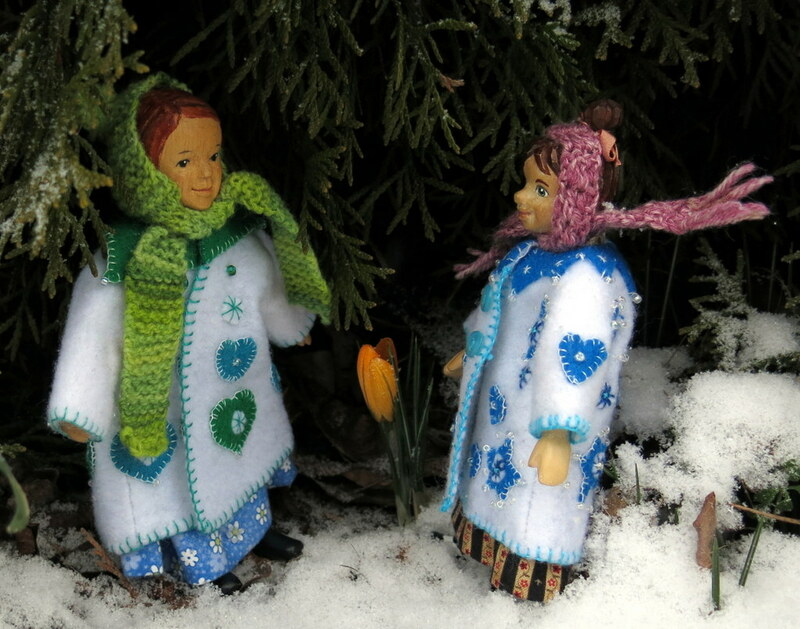 So nice to see the bright pops of colour in their outerwear, and in the tiny hints of spring still venturing to peek through the thick blanket of snow! Oh dear, Ice pellets sound nasty! The Hittys love these coats, wearing them reminds them of tasting peppermint candy! 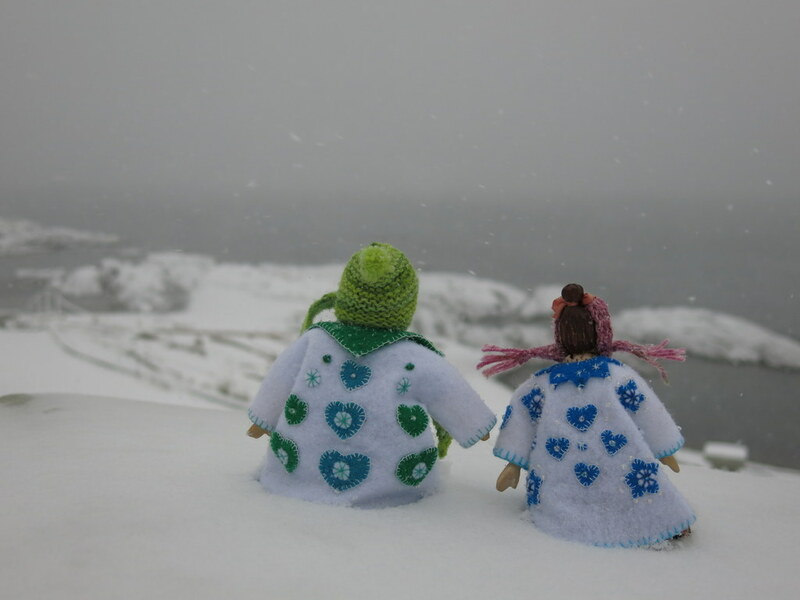 It’s good that the girls go outdoors even in grey days with snow…our winters have endless days like that…we are in an ice storm presently…but going out is important even for short spells to keep the old bones and minds going. Love the girl’s coats and hat-scarfs. Adorable! 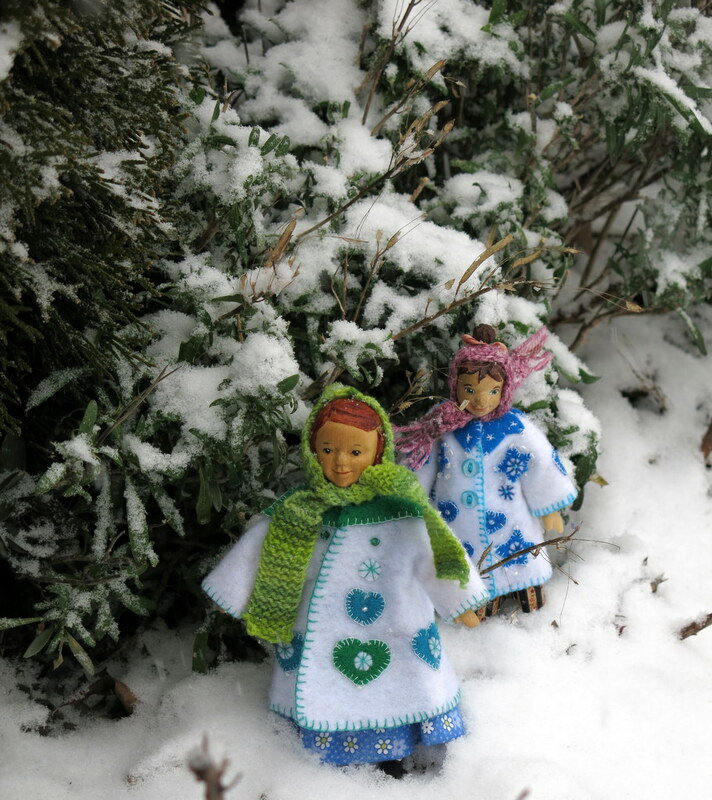 The coats were fun to make, and the Hittys love walking out in them,,,and they love their hat/scarves too – I feel warmer when I see them dressed warmly! The girls look so lovely in the snow with their gorgeous coats and bonnets. Hope your snow melts quickly and warmth returns. Thanks, we hope so too. 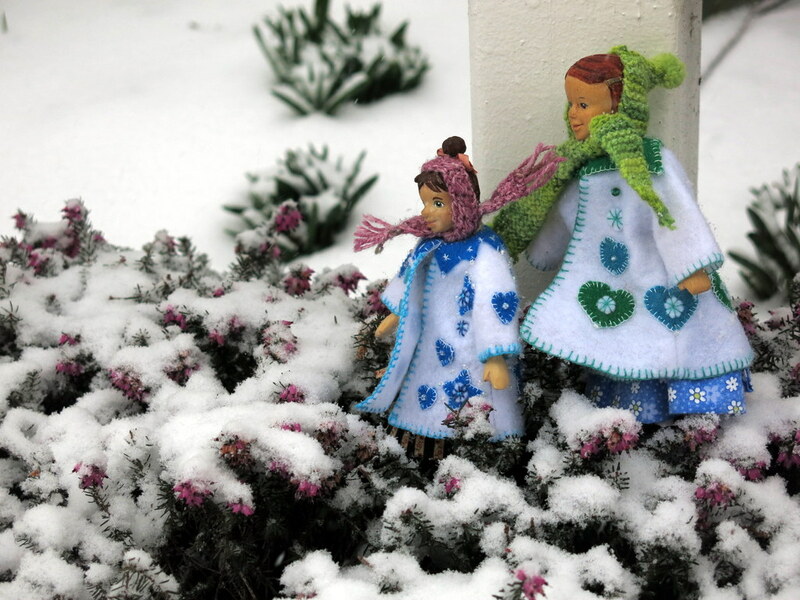 We love the snow but in small doses – it can’t warm up soon enough for us!